Illustration. 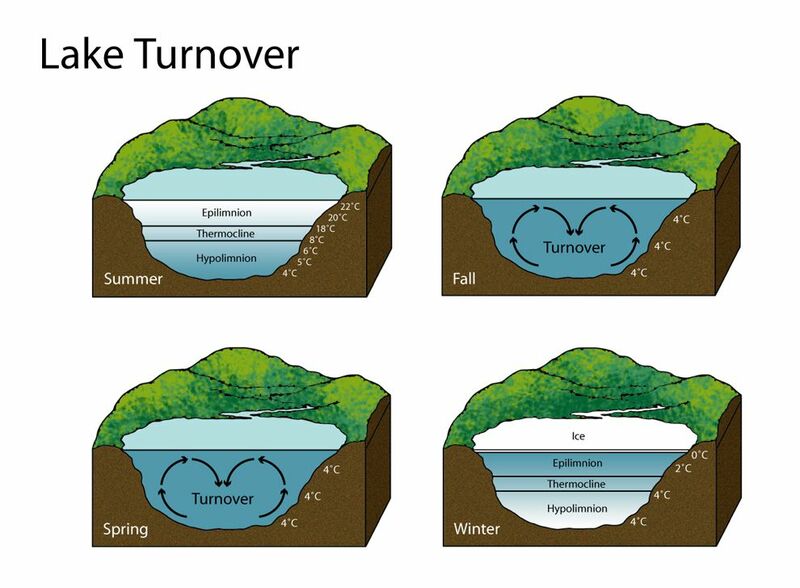 Lake turnover is the process of a lake's water turning over from top (epilimnion) to bottom (hypolimnion). Lake turnover is the seasonal movement of water in a lake. Shallow lakes experience very little lake turnover, while large, deep lakes experience major changes as waters of different temperatures mix. Lake turnover is the process of a lake's water turning over from top (epilimnion) to bottom (hypolimnion). During the summer, the epilimnion, or surface layer, is the warmest. It is heated by the sun. The deepest layer, the hypolimnion, is the coldest. The sun's radiation does not reach this cold, dark layer. During the fall, the warm surface water begins to cool. As water cools, it becomes more dense, causing it to sink. This dense water forces the water of the hypolimnion to rise, "turning over" the layers. surface and upper part of a lake. dense bottom layer of a lake. process of the dense lower layer of a lake rising to become the upper, less-dense layer.